It has often been said that a picture is worth a thousand words. There are times when key details of a picture are missing and it generates a thousand questions. The featured photograph in this article generated one question for what seemed like a thousand times. Although the “welcome arch” photo had been shared on many different web sites, there was little known about it. What was evident is that the arch was a commemoration of the fifteenth anniversary of the City of Miami and was taken in 1911. The story of the photographer and the location of the arch were a complete mystery until now. The residents of Miami were excited to reach the fifteenth anniversary of incorporation. Miami pioneers witnessed a lot of change and enjoyed a lot of progress in the city’s first fifteen years. By 1911, Miami was ready to celebrate and promote its accomplishments. There were parades, sporting events and a flight exhibition planned as part of the celebration. The parade featured decorated automobiles and a contest for the best floats. The procession began at Royal Palm Park and went west on Twelfth (Flagler) Street, traversing all of the principal avenues. It ultimately wrapped back around and returned to the park where it began. The baseball game was a contest between the Jacksonville Olympics and the local Miami baseball team. In addition to the game at Royal Palm Park, music was featured throughout the day. Some of the performers included the Second Regiment Band of Miami and the Key West Light Guard Band. Fireworks were set off from a barge in Biscayne Bay in the evening. The biggest event was an aerial exhibition by Howard Gill. Miami boosters had a Wright plane shipped down for the event. Gill was trained by the Wright Brothers and he provided a show of aerial maneuvers around the Miami Country Club golf course. 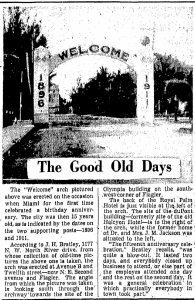 In addition to the aforementioned events, the welcome arch was erected to ensure that visitors were aware that they were entering the city of Miami during an important milestone. While the celebration events were well documented in local newspapers, there was no mention of the welcome arch in 1911. The arch was both ceremonial and simple in its design. It was white with two prominent posts. The post to the left listed Miami’s incorporation year (1896), and the post to the right listed the year of the city’s fifteenth anniversary (1911). Two American flags were prominently featured on each column. The arch between the two posts conveyed a friendly message to all who passed under it. It simply read “Welcome”. Miami’s Chamber of Commerce, led by Everest G. Sewell, wanted the celebration to convey how far Miami had come in fifteen years. What made determining the exact location of the arch difficult was the sparse amount of descriptive data associated with the photograph. What was known about the photograph was that it was part of the Romer Collection at the Miami-Dade Public Library and that it was shot in 1911. Gleason Waite Romer became one of the great photographers and historians in Miami during the twentieth century. He wanted to capture the stories of Miami through photography. He arrived in Miami in 1925 and lived in the area until his death in 1971. During his time in South Florida, he shot and preserved 17,500 negatives from the mid-1920s through the 1960s. However, it was rather curious that the “welcome arch” photograph, shot in 1911, was also part of the Romer collection. Gleason Waite Romer didn’t arrive in Miami until fourteen years after the picture was taken. A trip to the Florida room at the Miami-Dade Public Library answered the question. The sleeve for the glass plate negative revealed that the photograph was taken by J.H. Bratley. Romer purchased the negative from the Bratley family and incorporated it into his personal collection. Jesse H. Bratley was a farm boy from Wichita, Kansas who married Della Ransom from Wisconsin. The journey to Miami for the Bratleys was a rather adventurous tale. In the early 1890s, a restless Jesse decided to take the civil servants exam to be a teacher in the Indian division. He passed and was dispatched to Port Gamble, Washington to be a teacher for five tribes in the area. After two years in Washington, Della and Jesse moved to South Dakota and took an assignment to teach at a school for the Sioux tribe. From there they moved to Oklahoma and then to Arizona where they taught the Cherokees and Arapahos. By 1902, the Bratleys were ready retire from the nomad teaching lifestyle and moved back to Kansas. The Bratleys were raising four children at the time. They bought a forty acre farm. Jesse felt that returning to Wichita was his destiny. However, an ad in a newspaper changed the destiny of the Bratley family. In 1909, Jesse was serving on jury duty in Wichita when he noticed a torn piece of paper on the floor. When he picked it up, he saw an advertisement in a newspaper about J.A. Applegate shipping tomatoes from Miami, Florida. When he returned home and mentioned the advertisement to his wife and children, the family became obsessed with learning more about Miami. In 1910, Jesse filed a homestead entry for ninety acres in the Redlands. The family moved to the Redlands and learned that life in the pinelands was rather difficult. In order to afford to live, Jesse took the examination to work for the postal service. He became a clerk and later a rural route carrier for the Miami Post Office. After meeting the homestead obligations to own their land in the Redlands, the Bratley family relocated to Miami where Jesse and Della lived the remainder of their lives. The family purchased a home on the north side of the Miami River near Twelfth Avenue. The 1913 City Directory listed the family as “near the golf links”. The home was very close to what was Henry Flagler’s Miami Country Club golf course. Jesse Bratley remembered Frank Gill’s aerial exhibition in 1911 on the grounds near what would later become his home. As addresses changed as part of the Chaille plan in the early 1920s, the family’s home address became 1177 NW North River Drive. The location of the home was on the far western edges of the Spring Garden neighborhood along the north side of the Miami River. The Bermuda House Apartments are located where the Bratley’s home once resided. 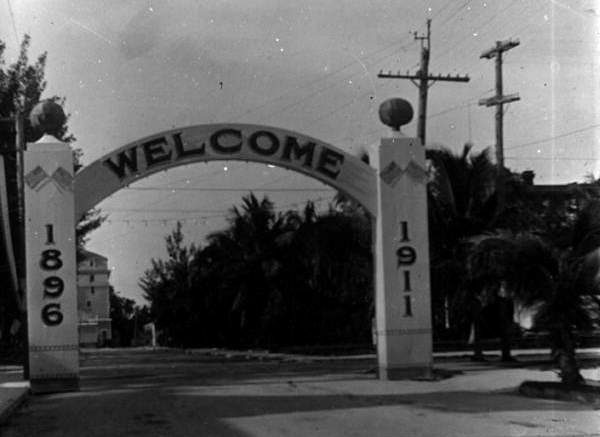 It was an interview between Jesse and a Miami Herald reporter in 1939 that provided the exact location of the mysterious Miami welcome arch. The “Good Old Days” article series were published in the Miami Herald and provided stories from Miami pioneers sharing their memories and oral history. The story in the April 7, 1939 issue was one shared by Jesse Bratley. The article featured a picture of the arch and the story of Jesse taking the picture. He shared his memories of the city’s birthday celebration and described the location of the arch. Jesse stated that the arch was located at the intersection of Avenue B and Twelfth Street. This is now the intersection of NE Second Avenue and Flagler Street. He went on to recall that the building in the distance, which is aligned with the left column, was part of the Royal Palm Hotel. The arch was directly east of the Halcyon Hotel. The Halcyon was built in 1904 by the first editor of the Miami Metropolis, Salem Graham. The hotel stood at the northwest corner of Flagler Street and NE Second Avenue until March of 1937. It was razed to make room for the Alfred I Dupont Building, which still resides at the same corner today. The arch was also adjacent to Dr. James Jackson’s home and surgical center. It was directly west of the Jackson home in 1911. Both the home and office were moved in 1916 from downtown Miami to what Miami residents now refer to as the Brickell neighborhood. The home was razed in 2004, and the office became the headquarters for Dade Heritage Trust. What Happened to the Arch? As mentioned earlier in the article, there was no formal announcement in any of the local newspapers of the construction of the welcome arch entrance on NE Second Avenue. There was also no record of the entrance being demolished or removed either. Based on other photographs of NE Second Avenue from 1912 through the 1920s, the welcome arch does not appear to have lasted longer than one year. It may have been built just for the celebration in 1911, but there is no documentation to confirm its longevity. While the question of location may have been answered with Jesse Bratley’s interview in the Miami Herald in 1939, what happened to it after it was removed from NE Second Avenue still remains a mystery. Miami Herald: “Romer’s Work Preserved” on December 8, 1997. Miami-Dade Public Library: “Romer Collection”. Special thanks to John Shipley for locating the welcome arch negative. Cover: Welcome Arch in 1911. Courtesy of Romer Collection at Miami-Dade Public Library. 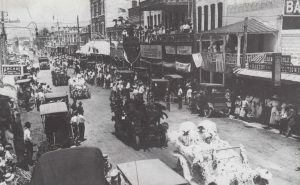 Figure 1: Parade down Twelfth Street in 1911. Courtesy of Florida Memory. Figure 2: Gleason Waite Romer. Courtesy of Miami Herald. 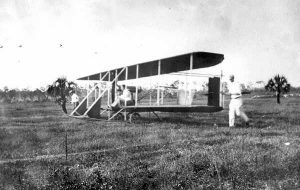 Figure 3: Howard Gill Aircraft in 1911. Courtesy of Florida Memory. Figure 4: Good Old Days Article in 1939. Courtesy of Miami Herald. 3 Comments on "The Miami Welcome Arch in 1911"
I thoroughly enjoyed following a historian’s thought process as he stubbornly set about gathering together, sifting through, discarding the “dross” and evaluating the remaining evidence. Thanks for a great job, and for answering that question at last! Yes I have seen this photo in various posts around the web and have always wondered about it’s location. Thanks for answering a lot of questions and a very interesting write up.